The 2020 Tundra is pretty much the same as the 2006. Yikes. The Tundra is a full-sized pickup truck that's now in its second generation. It still sells in good numbers despite the fact that it hasn't seen a redesign in 16 years. The Toyota Sequoia is based on the Tundra and has been suffering a similar long-in-the-tooth situation due to lack of a redesign. There are rumors swirling that the 2021 model is a full redesign for the painfully aging pickup. Except for some minor visual tweaks, new trims, and standard equipment, the Tundra is OLD. In a current automotive atmosphere where pickup trucks thrive, it's pretty hard to believe that the Toyota Tundra has sat pretty much untouched for over thirteen years. That's an insanely long period of time in the automotive world, and we're shocked we haven't seen a total redesign of this pickup yet. 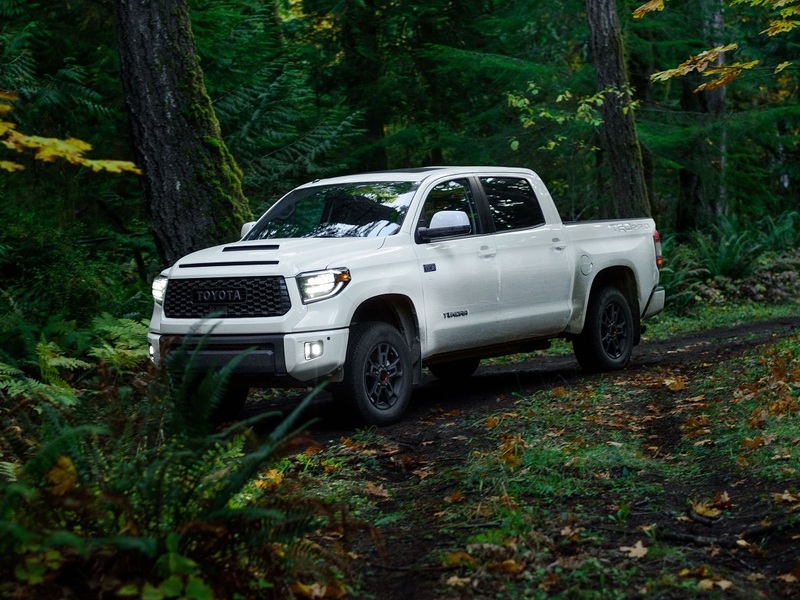 The Tundra looks dated, has only two thirsty engine choices, and has an interior that looks like it's from the Jurassic period compared to its newer competitors. The Ford F-150, Chevy Silverado/GMC Sierra, Ram 1500, and Nissan Titan are all far newer, more efficient, better designed, easier to drive, and have way better technology. The Tundra's V8 comes in two guises, a 4.6-liter V8 that emits 310 horsepower and 327 lb-ft of torque or a 5.7-liter V8 with 381 horses and 401 lb-ft. There is no diesel option like the other brands, and the 6-speed automatic slow to shift. Even when brand spankin' new, the Tundra's look is dated. The blocky body isn't bad, but it just doesn't look very modern when you put it next to, say, the new Ram 1500. The chrome bumper on the Tundra seems very '80s, and the fascia also seems very unimaginative. The interior is actually worse than the exterior. Though it recently received a new instrument cluster and some interior trim changes, it's easily the oldest looking pickup cabin in existence. The infotainment is terrible, some buttons and knobs are tiny and hard to operate, and that terrible giant shift knob looks like the handle to a cheap hand mixer. The good news is that Jack Hollis, general manager of Toyota North America, recently stated that Toyota wants to keep the Tundra alive. When asked by a reporter when Toyota plans to redesign the Tundra, Hollis promised that would happen, "soon." Now, that's pretty vague, but at least it points to a much-awaited change. Other automakers have provided excellent cabins. The Tundra's, however, is ancient. There have been some recent spy shots of the next-generation Tundra, but it's hard to believe that this uncloaked version is the new one since the body seems almost completely unchanged except for a different grille. It even has the same chrome bumper and foglights as the current one. The new Tundra will likely use the same underpinnings as the current truck, but the exterior and interior will likely get a total redo. This slightly different Tundra was spied in the wild, but it doesn't look much different. Another shot seems a bit more likely of a redesign since it's actually almost completely cloaked and has been seen testing around Ann Arbor with a current Ford F-150 trailing (the best-selling pickup truck's presence is no coincidence. The cloaked truck looks to be the right size and more of an evolutionary redesign than a totally radical one. This cloaked version was seen test-driving in Michigan. Could this be the next Tundra? Under the hood, we're hoping Toyota offers more efficient engine options, as well as a much-needed transmission in the form of a 10-speed automatic. The V8, which will likely stay, will also probably get more power to compete with potent V8s from Ford, Ram, and Chevy. The point is that it's high time Toyota brought a new Tundra to the market. It's been long overdue, and there's no way Toyota will get away with continuing to make the same truck for the next few years. Interested in the Toyota Tundra full-sized truck? Read our full review.